He envisioned a world where all children, both black and white, would be judged solely by the "content of their character." Photographer Flip Schulke shared this dream. Between 1958 and King's tragic death in 1968, Schulke enjoyed a remarkable friendship with the civil rights leader. 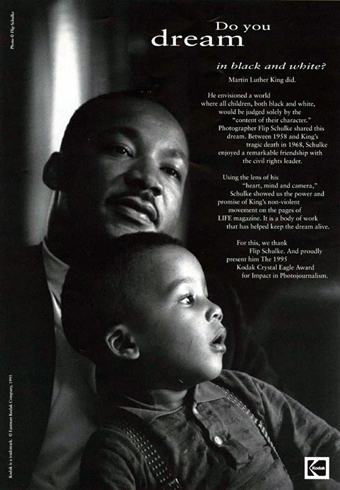 Ad was written for Saatchi & Saatchi client, Eastman Kodak. Required both writing and creative direction along with several phone interviews with Flip Schulke, King's renowned photo-biographer.